Florence, Italy. The home of Leonardo Da Vinci, Dante, Michelangelo, David, and for four short months it was my home as well. This city is made unique with the continued persistence of the Renaissance in everything around you, but then you turn a corner and see the elaborate street art and there’s no question you’re in the 21st century. Florence was the perfect place for me to study. I loved every minute of it, and there was not one downside to Florence, expect the tourists. I loved living two minutes from my favorite piazza and church, Santa Croce, and only five minutes from my favorite panini shop, Pino’s. This semester couldn’t have been what it was without my amazing roommates, four girls thrown together in a brand new country, who’d never met before, were from completely different parts of America (Iowa, NY, Illinois, Rhode Island), who miraculously got along and loved each other. I’ve had the greatest experience of my life—from traveling all over Italy as well as going to an additional five countries that I’ve never been to before. I’ve met amazing people from all over the world, making great memories and friendships. Honestly, if you have the opportunity and the means to study abroad, don’t pass it up. There might be a few times while you’re abroad that you feel homesick, but then you remember that you’re in ITALY (or wherever) and you know it’s one of the best experiences you’ll ever have. When you’re 60 you’ll still be telling the story of when you saw a “Beatles” cover band in Italy, then went and sniffed out a secret bakery at 2 am, getting the greatest chocolate croissant of your life. I will miss everything about Firenze, from the food to the sights. Leaving Florence is bitter sweet, but I know that I will carry the experiences that I’ve had here with me forever, making this departure easier to handle. Study abroad. You won’t regret it. Our thanks to Paige, pictured here, for sharing a glimpse of her study abroad journey with us. Saint Rose offers study abroad opportunities in 35 countries– from Scotland to South Africa. 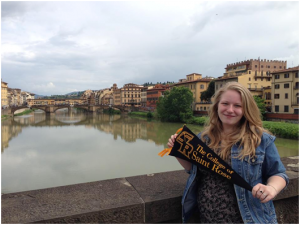 Learn more about Saint Rose study abroad programs here.